Nicaragua and Guatemala are located in Central America. Both countries have suffered from conflict and violence in the late 20th century from Guerrilla organisations, which has caused political instability and turmoil. (1) A great deal of land was abandoned because of the guerrilla groups in the countryside. The land was then taken and distributed by guerrillas to other people. Once the conflict was over, coffee was the new agricultural source of revenue for farmers. In fact, 90% of the coffee produced in Nicaragua comes from smallholders; the remaining 10% comes from farms that have had their land for decades. The two main challenges for all producers are climate change and the low futures market. Similarly, the majority of farms in Guatemala are also small holders because of their uncertain recent history. This report illustrates the uniqueness of each producer and shows the importance of constant research on new varietals, processes & new agricultural techniques. This, along with our feedback from roasters on what they need, has helped the farmers to penetrate the specialty market and in these challenging times, allowed them to get more revenue for their coffee. We started the trip in the two main producing regions in Nicaragua: Matagalpa and Jinotega. We then flew to Guatemala where most of the trip was spent in Chimaltenango and Acatenango. After a rather snowy flight out from London Heathrow, thankfully all the members of our trip made it to Managua, Nicaragua. There we met our friend Victor Robelo who is the owner of Las Nubes, a group of seven estates located in Matagalpa and Jinotega. He was born into a coffee producing family, however he had to leave Nicaragua when he was a child during the civil war. He came back in the late nineties and bought back the farm Las Nubes that was taken by the guerrillas during the civil war. Since then he has invested in his farm, planting his father’s favourite yellow Catuai and Caturra varietals. We visited two of the main estates we buy coffee from; Las Morenitas and Santa Maria. We’ve been buying coffee from these estates for over four years now. 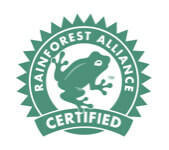 Las Morenitas is a Rainforest certified farm of 200ha, located in Jinotega at 1150masl. 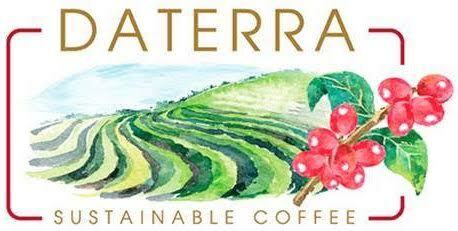 Caturra is grown on 80% of the farm, with many young Marsellesa plants that have replaced the Catimor. At the peak of the season they employ more than 200 people who are payed almost 35% higher than the minimum wage and are fed and housed on-site. This ensures the workers are well skilled in picking and the same workers come back year after year. The second farm we visited, Santa Maria, is located at 1500masl and produces up to two containers of mainly Caturra and some Catuai. Victor works with Jimmy Merwish who manages the seven estates. 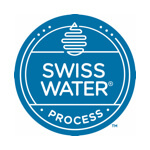 They are both focused on quality and are developing new processes such as natural, and all types of honey. Four years ago, Las Nubes bought their own dry mill and warehouse. Each estates coffee is wet milled at their own estate and then transported in wet parchment to the Dry Mill in Matagalpa. All the coffee is sun-dried in various stages, from 100% sun to different levels of shade. This ensures a homogenous drying process for both the cherries and parchment. All the coffees are then milled and packed on site. To further their work on producing better quality coffee Victor plants new varietals (such as the ones mentioned above) to resist against the diseases Roja and Ojo de gallo and to get distinctive high score profiles such as the Java from Avecinias farm – which cups flavours of Orange tangerine plum and chocolate. We then travelled to La Bastilla estate which is managed and part owned by Mr. Markus Fisher. The farm has 311ha of land, of which half is dedicated to coffee. The farm is also undergoing major renovation to introduce new rust resistant varietals such as H1, H3 and Marsallessa. They renovate on average 5% of their farm a year line by line or block by block. The rain this year was very unusual; Markus has managed the farm for more than 15 years and has never experienced weather like he has done this year. The rain was sporadic and came early in the season resulting in a lower volume crop and longer harvest period. 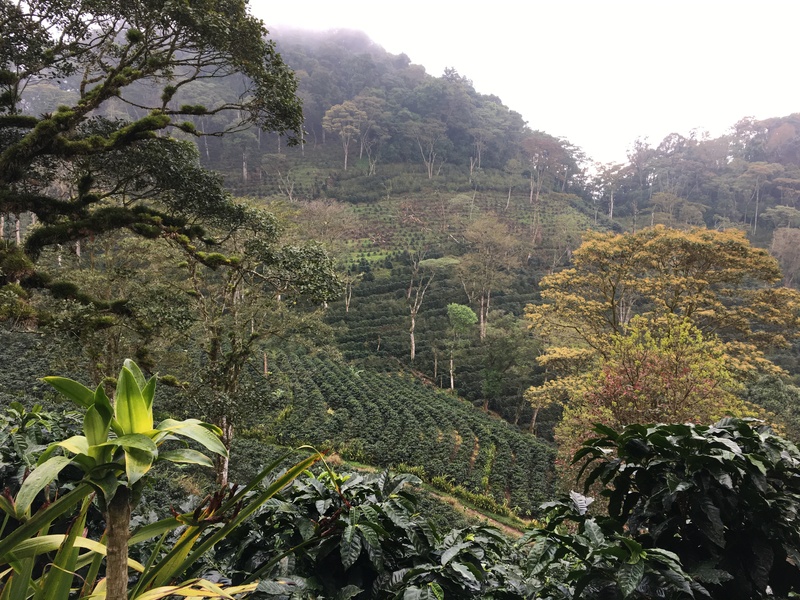 Some exotic varietals such as Geisha were planted in La Bastilla in small volume to add some high scoring specialty coffee to their offers. 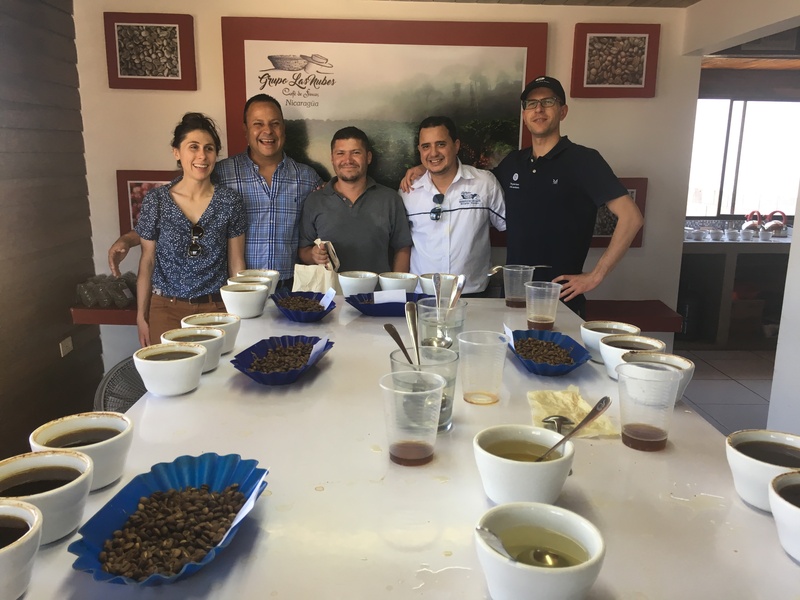 The biggest surprise of the visit at La Bastilla was during a cupping session in which we cupped lots which were being held for the cup of excellence, we all had an explosion of flavour in a coffee that tasted like strawberry, lavender, caramel & lime. We were told this coffee was a new experiment of yeast anaerobic fermentation. We have decided to have five bags of coffee specially processed while we were there, from the picking to the fermentation, we participated in the entire process. 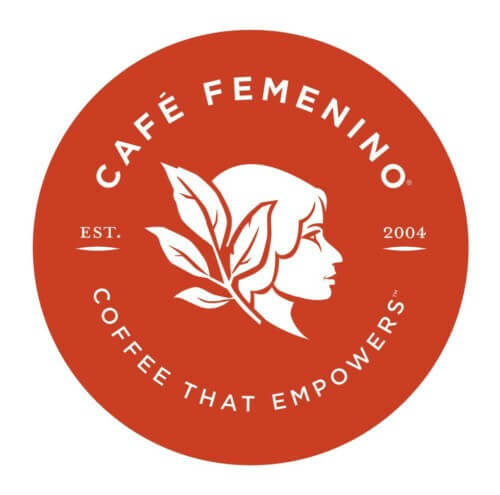 We are so excited to get this coffee for the first time ever in June 2018! At La Bastilla, their main goal is to educate the young generation and give them an opportunity in the coffee industry. Therefore, they have implemented their own agriculture school for teenagers between 13 and 18 years old. The school is self-financed, mainly by the amazing Eco lodge we stayed at. All students work one weekend a month at the lodge to contribute their own revenue to their school. They apply the old adage “Teach a man to Fish” which is also the name of a charity they work with. For more details click here. The young Generation is also one of the focuses for Aldea Global Cooperative which is managed by Warren Armstrong and Ivania Riviera. They hire young educated coffee producers’ children who have just finished school. They are then trained by two main agronomists at the Cooperative, so they can help develop sustainable and innovate practices at the farm level. Aldea Global represents 9,000 members today of which 3,000 are coffee producers. They have grown at a fast pace since 2012 when they started to provide micro credit to the producers at a 15% interest rate against 45% which the bank is offering. This substantial change allowed small holders to sustain their production and for some, increase their production. Ramiro Antonio Cruz from San Estaban farm located in Las Mercedes community is an example, he has been able to buy an extra 1.5 ha since he got the Micro Credit. To manage the members and all operations Aldea Global has a customised software which allows full traceability and information from the farmer to the importer. Aldea Global also started their own certification and ranks their members by farm management practices, yield and quality. The system of premium is set up accordingly by rewarding those with higher scores which pushes the producers to be at their best. The small holders of Aldea Global also have access to several projects that the Aldea Foundation, created in 2015, runs. They are focusing on water treatment to avoid contamination, providing health care, education and nutritional advice. Aldea Global is the biggest coffee cooperative in Nicaragua and the sixth biggest coffee exporter. 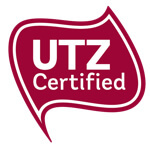 They have sustained coffee producers thanks to the premium through various certifications such as Fairtrade, Rainforest, Organic, UTZ and also traceability projects like their Direct Trade branding or Colibri Azul which comes from five specific communities including Las Mercedes. Left to right: Mantvydas DRW, Gemma Aldea Global, Ivania Aldea Global, Ramiro San Estiban, Priscilla DRW and Juan Aldea Global. We were all impressed by our partners in Nicaragua who are succeeding to develop and grow their businesses, especially under these tough conditions. This year the harvest was lower than excepted due to inconsistent rain at the wrong time. The rain caused most of the cherries to mature too fast and they fell from the trees before picking began. They hope for better weather conditions next year, as do we. The unpredictable weather conditions and low NYC market makes it a challenging time for farmers. This is why it’s even more important for a sustainable farming solution so that farmers get sufficient revenue and are profitable even in these hard times. We saw an example of this through ‘sector diversification’ at Pacayal Estate in Guatemala where they mixed coffee and Macademia production. 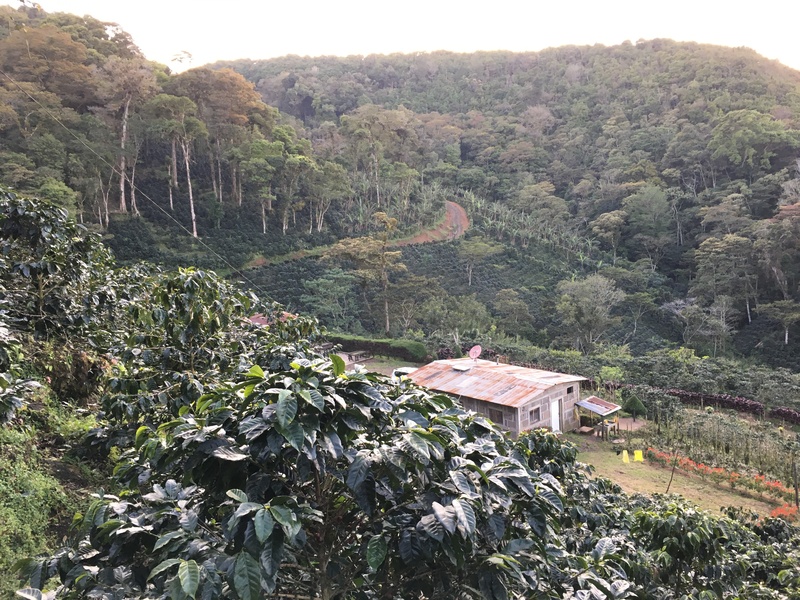 Pacayal estate is owned by Dieter Nottebohm and Thomas Hoffman, and managed by the latter. It is in Chimaltenango close to Pacayal volcano. It is a 3,000 ha farm but only 800 ha of it are planted with coffee. The rest is a protected wildlife reserve, teaming with macadamia trees. They have had the farm since 1991 and have been growing macadamia for the past 10 years, which has a lower cost of production. They have their own wet and dry mills on site and would like to invest more in specialty coffee in the future. However, for now they are experimenting with honey and cascara. They have higher quality coffee in the part of the farm called Pacayalito, where we get our coffee from. It is Catuai, Caturra and a bit of the Pache varietal. The altitude ranges from 1300 to 1500masl and the maturation of the bean is therefore much slower. They prune the shade trees yearly and prune toppingat the top of the tree) the coffee trees every six years as it produces a healthier tree, as opposed to stumping. The farm is almost organic as they mainly use compost. Pacayal Estate has its own little village where you can find a school, a church and the accommodation for their workers who are paid by picked coffee weight and are provided three meals a day on-site. All the coffee is fully washed at Pacayalito. It is washed, fermented and soaked for 24 hours, and then mechanically dried in Guardiolas (mechanical silo driers) . We had a lovely timed there which was topped off with a beautiful evening with the Nottebohm brothers and Thomas who gave us the honour of drinking beer they brewed themselves! On the menu were styles such as: blonde, IPA and coffee porter. Transcafe is the exporter for Pacayal Estate and is a family company owned by Dieter and his family. They own another estate, Nueva Granada,that is in San Marcos and also processes coffee from the surrounding area. 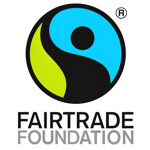 Transcafe used to be the biggest coffee exporter in Guatemala but has diversified into other products such as macadamia, cardamom and sugarcane. 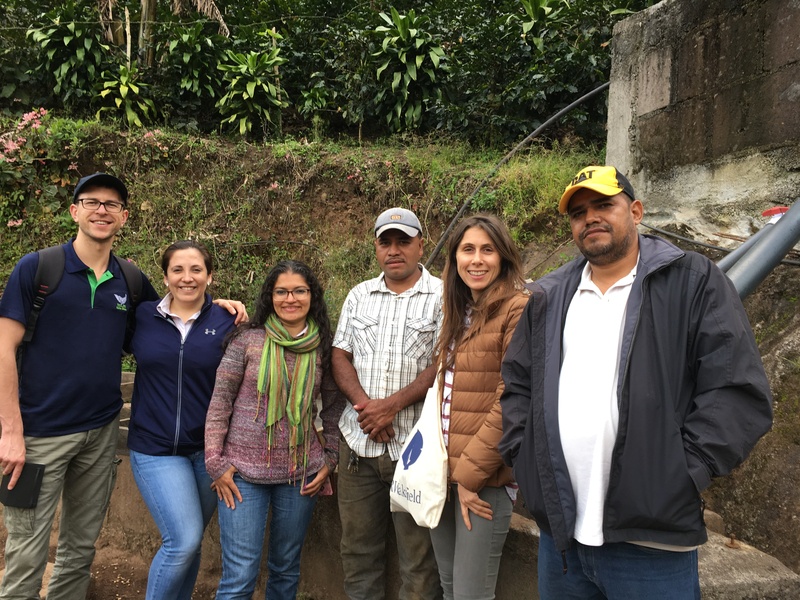 We also spent time with another partner Fedecocagua that has been successful thanks to their hard work and focus on coffee. We spent most of our time with Gerardo De Leon (Head of Commercialization) who is the main link between the Cooperatives and DRWakefield, who contributed to the success of the Cooperatives. Fedecocagua is an example of a successful model where there is a strong direct link between the exporter (union of Cooperatives) and primary groups. They invest and support all of the small primary cooperatives. 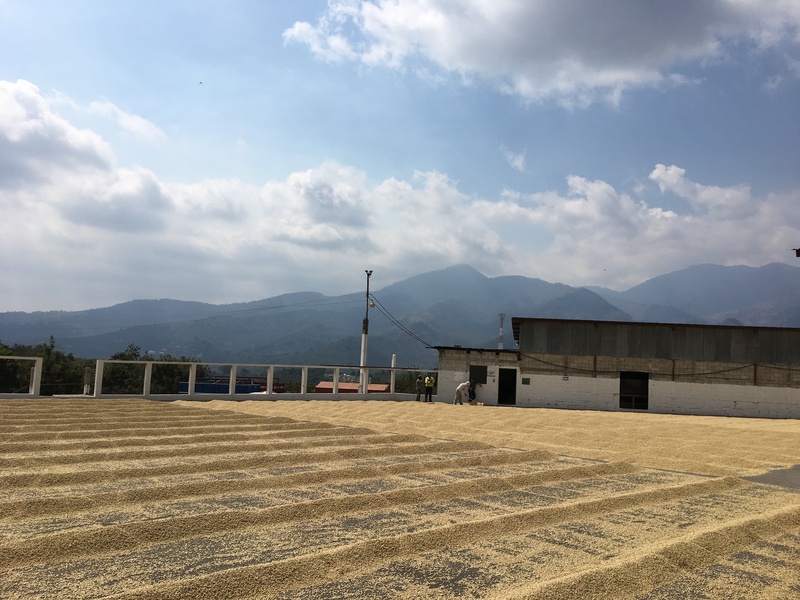 They add value to the primary group by offering traceable coffees such as Cooperativa La Pensativa in Acatenango who produce a consistent coffee cupping at 84 plus SCAA. The cooperative is close to the volcano El Fuego. Small holders there have had challenges with hurricanes and earthquake eruptions, it’s a challenging place to grow coffee but the results are amazing. They are a well-run organisation that was founded in 1972 and also have one of the oldest varietals ‘Arabigo’ that makes the cup so special. Expertise and constant evolution of their knowledge increases the quality thanks to Juan Carlos and Adolfo, who are agronomists at Fedecocagua. 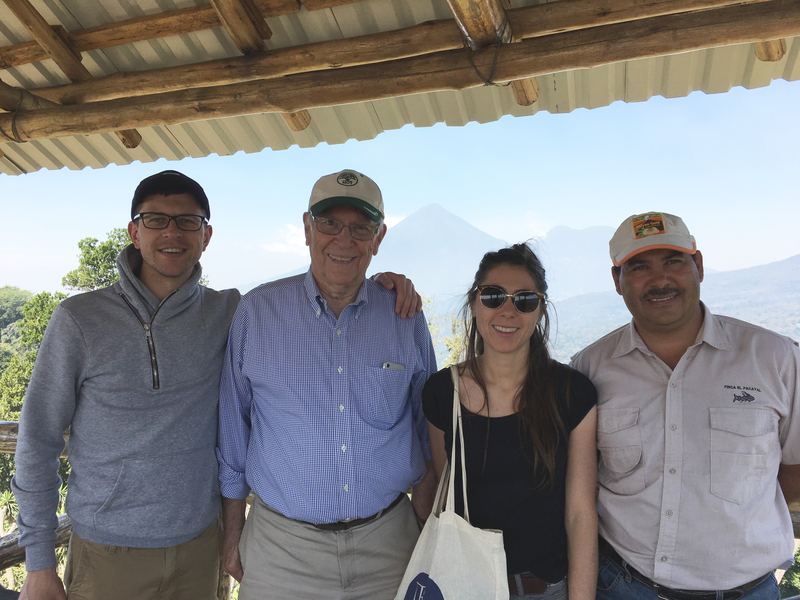 The last cooperative we visited was Acatenango Cooperative, founded in 1977 and located in Acatenango. Now they have 351 members who farm around 1000 ha of coffee. They dry coffee at Acatenango with control and expertise. They pre-dry on patios for a day and then they dry in Guardiolas for 40 hours at 45 Degrees for the first few hours and then the temperature is again reduced to 30, and then to 15 degrees. It ensures the whole bean is dried evenly and consistently. If the temperature is too high it will burn and cook the outside of the bean, leaving the moisture too high in the inside of the bean. An even drying allows a good conservation of the quality and avoids coffee ageing too quickly. Once the coffee is ready in dry parchment, the coffee is delivered to the Fedecocagua Mill located in Pallin where the quality and grading is controlled by the cupping team lead by Gustavo. He also controls the production at their main dry mill in Palin. 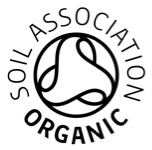 They have an efficient team of 35 people who work well in a clinical environment where the full range of quality from stock lots to the highest micro lots scoring 87 SCA points are cupped. Coffee is stored in parchment before export. They export more than 430,000 bags a year. We spent the last night of the trip having dinner with Gerardo De Leon at his home. 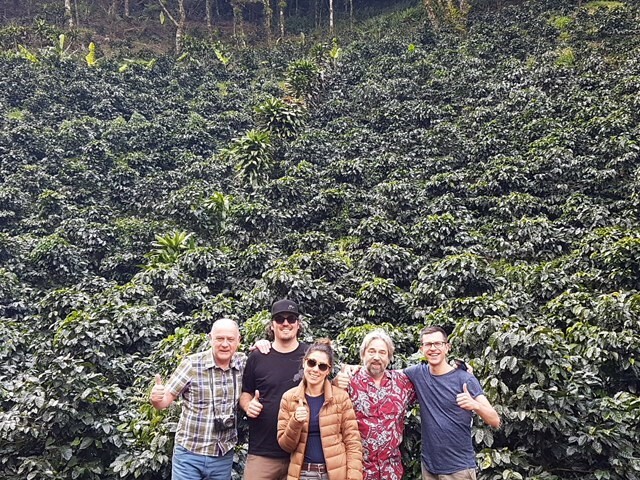 We enjoyed His warm hospitality, talking with his wife and children and it was again an experience with not just our supply partners but with our coffee friends. We have been so warmly welcomed by all our coffee partners/friends. We experienced great hospitality at their offices, mills, cooperatives and homes. We have strong and long-lasting relationship which gives us the confidence to penetrate our market with their coffee. We came with an idea to add value to their coffee which satisfies the demands of the specialty market-closer traceability to the small holders, regional coffees, new processes, new varietals and different types of fermentation. 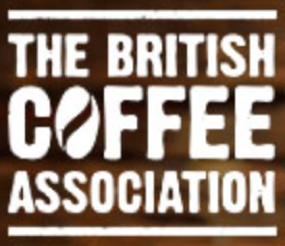 Along with social, health and environmental angles, it all provides for a very complete coffee range! We could not thank enough our travel companions the 2 Ians and Micheal. Without them trip would be lacking the unique sparkle they brought. We are looking forward to share these coffees with all of you at the arrival.